On a sunny Saturday, at the family residence of former SG president, Randy Jose, SG members gathered and collaborated for six hours to list SG’s accomplishments since the last retreat in 2016 based on its 5 strategic directions, and created do-able action plans for future tasks that would achieve the goals of each direction. SG extends a great salamat to our generous and kind host, Randy Jose, who participated in all activities, including the amusing and enlightening M&M candy icebreaker, and the heartwarming reflections of what we’re thankful for and our statements of the contributions we will make toward SG’s success. 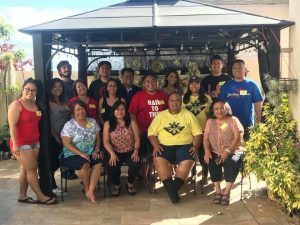 Much mahalo to Mia who organized and facilitated the day’s tasks, and thank you to the Board and Program Committee members who worked diligently and purposefully to accomplish the goals for the day. Board Members in attendance: Milli Asuncion, Myrna Burigsay, Bryan Estoesta, Lana Fernandez, Leon Florendo, Mia Luluquisen, Mike Sana, Trixie Soria, Rouel Velasco. Program Committee Members in attendance: Alex Bautista, Shirell Bell, Hannah Beltran, Leilani Magaoay, Anjannette Pablo, Julie Tabarejo, Viktor Yago.